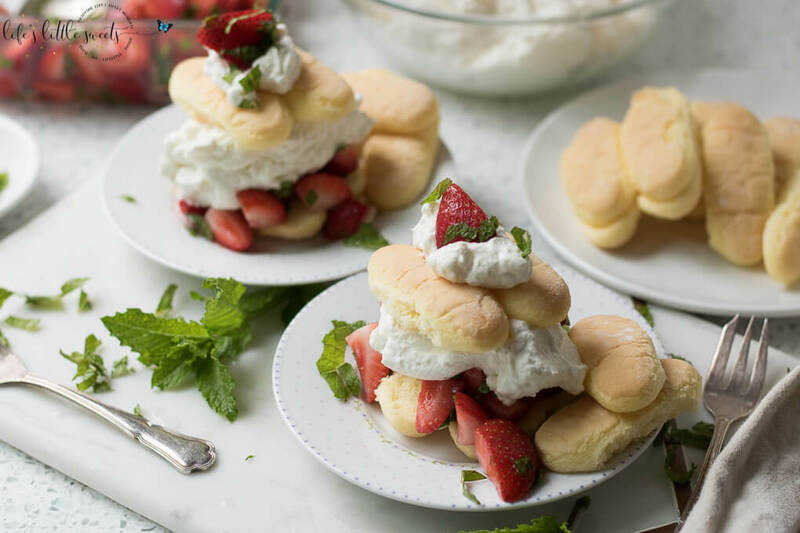 Strawberry Mint Shortcake with Ladyfingers is a no bake, easy to assemble strawberry shortcake recipe with macerated fresh mint and strawberries, homemade vanilla whipped cream and ladyfinger sponge cakes. 1 recipe Vanilla Whipped Cream search LLS search bar "Vanilla Whipped Cream"
In a medium mixing bowl, mix quartered strawberries, sugar and mint. Let sit in the refrigerator for 60 minutes or overnight. Place ladyfingers (2-3, leave attached to each other) on a plate, spoon some strawberries over the lady fingers, spoon the vanilla whipped cream over the strawberries, place more ladyfingers on top, Garnish with more whipped cream, a strawberries and mint, serve and enjoy!